The 2016 Wood Program project ‘Kokoon’ was designed and built to address the current housing situation in Finland and the severe shortage of temporary housing solutions for students, asylum seekers, displaced residents, and others with similar short-term needs. In urban and sub-urban contexts, the pre-fabricated modules can be transported and combined into various configurations to fit numerous sites. Rather than the typical approach of autonomous, deployable steel containers, Kokoon allows for habitable space that can expand vertically and horizontally. Inside, the units deploy simple approaches to storage, lighting, and spatial division ensure that the residences are both practical and dignified. 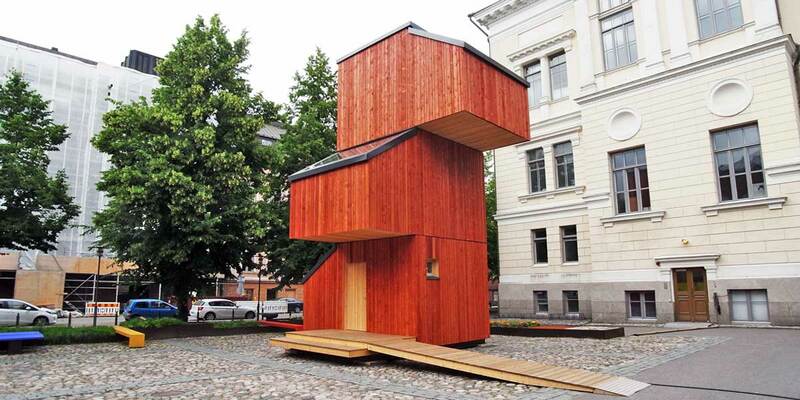 Three prototype units were finished in Otaniemi and then assembled on-site in one day in the Museum courtyard. They will be displayed at the Museums until the fall and then used in various locations around Finland over the coming years.